This adventure-anthology clocks in at 56 pages, 1 page front cover, 1 page editorial/ToC, 2 pages of advertisement, 2 pages of SRD, leaving us still with a rather impressive 50 pages of content, so let’s take a look! 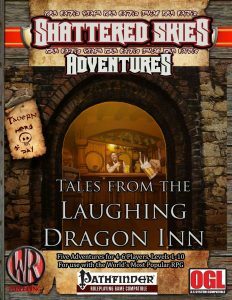 It should be noted that the eponymous tavern, the “Laughing Dragon Inn”, is depicted between front cover and editorial/ToC-page, with full map and brief room descriptions – the section can be used as a kind of hand-out, if you wish. The full-color map provided is nice, though it should be noted that no one-page or high-res jpg-version is included – if you just want to hand out the map, you’ll need to cut off the text. This holds true for all the maps contained herein. Whether or not you consider that a plus or not depends on your tastes. Unfortunately, there are no key-less player-friendly maps in the pdf. It should be noted that the advertisement text is incorrect – these adventures are not for levels 1 – 10. Please consult my discussion of the adventures below for the proper level-ranges covered. All right, got that? Well, we begin this book with a recap of the storied history of the Laughing Dragon Inn. GMs do get an extended history of the place, 6 sample events during night-time and 8 fluff-only write-ups of tavern staff, from barkeeper to owners to servers. Speaking of which: The picture of the servers is pretty much fanservice – personally, I’m not a big fan of the picture, as the exaggerated cleavage of the ladies felt like a bit too much…but then again, the pdf does something clever and actually makes that a plot-point of sorts….which is pretty ingenious and smart. Beyond that, the pdf does go into lavish detail regarding the inn’s menu: Food, drink and desert all get their own list of entries, with a general idea of prices provided as well. All in all, a solid way to start the compilation and establish an identity for the place within Brighton. All right…and this is where we begin taking a look at the adventures. As such, I’d strongly advise potential players to jump ahead to the conclusion. All right, only GMs around? Good! The first module would be Kendra Leigh Speedling’s “Dust to Dust”, intended for level 4 PCs. The PCs attend the festival of St. Gran the Dust Warden, but the festivities don’t last too long – the PCs soon find that the wizard Viravar Harx has been murdered. The investigation of the body comes with multiple skill DCs to use. Mysterious: There don’t seem to be any tracks, just blood droplets here and there…and, big plus, the pdf does take some spells into account, though, alas, the spell references are not properly italicized – this, unfortunately, does happen more often throughout the module – the formatting could have been more precise here and there. Anyway, the trail has not gone cold – and people seem to suspect Dervila, the sorceress, who would be the rival of the deceased wizard. The sorceress tries to Bluff the PCs away and is pretty good at it – but sooner or later, they will have to get inside of the house – in her workshop, the PCs will have a chance to duke it out with a junk golem and ultimately, will be able to track the sorceress to a hidden cave beneath her home – where cave scorpions and wights await – annoying formatting glitches in the stats, unfortunately included – while they can be used as written, there are e.g. plusses before CMD-values. Weird. On the plus-side: The artwork for Delvira is really neat – consumed by rage, the sorceress has become a penanggalen sorceress – a relatively brutal showdown. All in all a decent sidetrek with some cool monsters…though the BBEG didn’t exactly act that smart. Rodney Sloan’s “The Demon’s Paw” is also for PCs of 4th level. Uness you believe the ToC – then it’s intended for 6th level PCs. It also takes place on a festival – the Wyre’s Winter Weave Festival. Dieter Hagen, who did not have an easy life, to say the least, has recently come into the possession of a demon’s paw…and this babau’s paw was unfortunately shown to less than scrupulous folks. Dieter is thus in attendance when a CR 7 fetchling dancer takes center stage with her haunting sandman abilities – this distraction is used by cultists to infiltrate the inn, capture Hagen and try to summon the demon – if that works out, stats are provided…and yes, the paw is a nice variant crawling claw. A nice artwork of a blood-spattered handout can also be found on one page – which not have that as a full-page hand-out in the appendix? Stopping the cultists, with or without having to deal with the demon, will end the sidetrek, though the reputation of the PCs may suffer from the involvement in the eerie proceedings, just while the cult of Shub-Niggurath starts plotting against them. Basic version of the monkey’s paw-theme – the weakest module herein, barely more than two encounters that PCs will probably hack through before realizing any aspect of the story. “Under the Revenant’s Mask” by Thiago Rosa is up next, written for characters level 6 – 8. Strangely, this module doesn’t seem to sport a synopsis. Aurora, the daughter of Doctor Damile, is a talented singer that has fallen in love with Ceasar, a cook. Damile sought to impersonate Ceasar via disguise self (not italicized), but went overboard – his daughter died in a tried accident while running from him. Aurora has now returned as a revenant, hell-bent on revenge against an innocent and grief-stricken Ceasar, which Damiel sees as a chance – he had planned to resurrect his daughter via alchemical means…So that’s the set-up. Slightly strange: The first attack of zombies and revenant that kicks off the module does not get the usual encounter-formatting, happening exclusively in the flavor text. Anyways, Ceasar hires the PCs and they will sooner or later want to contact the local merfolk information broker (whose stats contain glitches). Maartin Bestor, the noble with a penchant for occultism, is not a kind man – but he may identify the zombies as alchemical creations. This will lead the PCs sooner or later (perhaps after the similarly basic depiction of the second night’s assault) to Damiel’s abode, where more undead roam – including Aurora, who gets a really cool artwork. Here’s the thing: Damiel is a potent alchemist – if the PCs haven’t figured out his possible involvement in the death of his daughter, the finale may well prove to be beyond them. That being said, there isn’t much in the way of proof other than speculation and roleplaying the dynamics here – which is a bit of a pity, for the visuals of the masked remnant are cool. This adventure suffers from its brevity and feels like an abbreviated form of a story that should have been more complex. “Take me to the River” by Anthony Torretti is a sidetrek for 8th-level characters. The PCs are hired by a mining company’s prospector to investigate the disappearance of her assistant, convinced that Brighton’s folk are somehow involved. The PCs also encounter Artinus, an eccentric local druid and begin a brief local investigation here: Theis is structurally the best investigation in the book: We get read-aloud clues, several of them, guiding the PCs through the questioning process and the closer investigation of the man’s disappearance. The deductive reasoning to recreate the last whereabouts of the missing assistant is nice. The trail leads to the outhouse, which actually features a sewer system! In the mapped sewers, the PCs will have to face elder things and cultists…and rescue potentially the missing Lenam…who tells the PCs about the horrid, planned assault on the mining camp: In the water, pods (DCs to analyze the like provided) are bound to hatch, unleashing horrors upon the camp! The PCs have to get to the camp and deal with the Broodqueen of Shub-Niggurath (who comes with a GLORIOUS artwork) before the vile brood of elder things hatches. While not perfect, the sidetrek is structurally the strongest and presents a fun module. The final adventure would be “A Comfortable Skin”, penned by Charlie Brooks, and intended for 10th level characters. Few entertainers are as popular as the gnomish pair Kavan and Lira Thresser and their adopted gnome son Barradan. Mywynn and Tannileigh seem to bit out of town, leaving Kavan in charge of the Laughing Dragon. He offers the PCs some serious money for the retrieval of stolen goods – and so the PCs set out to confront the Plundering Blades, relatively powerful, multiclassed bandits. Interrogation, however, yields that the bandits were hired to retrieve the stolen goods via nonlethal means by Teera Greyth, a seamstress. She is convinced that something’s not right at the Laughing Dragon…and close inspection of the intercepted shipment shows no less than 9 scrolls of gentle repose in a hidden compartment. At the Laughing Dragon, the PCs may well stumble into a deathtrap: The entertainer family has been taken over by intellect devourers…one of them even sporting assassin levels! And yes, both Mywynn and Tannileigh may be rescued…provided the PCs survive the brutal trio of aberrations… Solid, challenging, combat-centric sidetrek. Editing and formatting are not exactly perfect – there are several formatting glitches, a couple of typos and if you’re picky about statblocks being correct…well, you’ll find hiccups there as well. Layout adheres to an actually beautiful two-column full-color standard and the pdf sports copious amounts of artworks – including some really amazing, high-quality pieces. Big kudos. The cartography is full-color and also sports some nice maps – though I wished we got one-page versions of them…or player-friendly ones. As provided, their lack represents a comfort detriment. Speaking of which: It is puzzling that an anthology of this length has no bookmarks whatsoever. Wile we’re at it: You can’t highlight or select text from the pdf, which is a further comfort detriment when creating your own notes. Robert Gresham, Kendra Leigh Speedling, Rodney Sloan, Anthony Torretti, Charlie Brooks, Simon Munoz, Thiago Rosa and Jarrett Sigler have created a per se pretty solid anthology: While some of the modules suffer from their brevity a bit, as a whole, we have a couple of solid dark fantasy yarns here – nothing groundbreaking, but as a whole, I’d consider this compilation to be on the positive side. Considering the low asking price, the amount of content is pretty neat. I’d tentatively recommend this compilation in warmer terms if it was at least a bit convenient: The missing player-friendly maps, the lack of bookmarks, the glitches, which, while not crippling, do accumulate…they all conspire to drag this down. The adventures themselves are challenging and very lethal, as befitting the relatively dark fantasy-ish themes – and as a whole, I liked how this uses the Laughing Dragon Inn as a sort of story nexus and hub. The pdf, in short, does have something to offer if you’re not picky about formal hiccups – there is fun to be had here. That being said, I can’t overlook the shortcomings the compilation does have. Hence, my final verdict will clock in at 3.5 stars…but honestly, I can’t round up for this. If you’re looking for some brief, inexpensive dark fantasy sidetreks and don’t care too much about weaknesses in organization, editing and formatting, then this may be well worth checking out! You can get this compilation of inexpensive sidetreks here on OBS!